Self-billed as the most luxurious hotel in the world and commonly known as the world’s only 7-star hotel, the Burj al Arab exudes extravagance and luxury. Every room is a two-floor suite, the most basic of which boasts sea views over Dubai Marina and the Palm or Jumeirah. While you’re there, don’t miss drinks at the Skyview Bar (before dusk to enjoy the gorgeous views), enjoy seafood at the Al Mahara gazing into the floor-to-ceiling aquarium, and the relax at the indoor pool at the Talise Spa on the 18th floor. One night starts in the range of US$2000++ for room, breakfast and transfers in high season. Don’t have your own yacht? Or perhaps you just couldn’t sail itto Dubai. No worries! You can rent one easily from Dubai Marina with your own captain and crew, refreshments and amenities. Take it for a spin around the back of Dubai Marina, past the Atlantis and the Burj al Arab, then enjoy a swim in the Arabian Gulf. Forget camping. Just an hour’s drive from Dubai you’ll find the Al Maha Desert Resort. This is the ultimate in desert living. Every villa has a private plunge pool overlooking stunning sand dunes where you may just catch a glimpse of Arabian wildlife including oryx, foxes and hares. You can choose to stay overnight with full board and two activities included, or just pop in for the day to have a 3-course lunch (expertly prepared by Executive Chef David Miras and his team) or use the spa and pool. An overnight stay including full board starts at US$1600++ in high season. With cheap petrol, a relatively low tax on cars and plenty of long straight roads, it’s commonplace to see Ferraris, Lambourghinis, Maseratis whizzing by. Even the police travel in style with a Bugatti Veyron, Lamborghini Aventador and a three Porsche Panamera S E-Hybrids in their fleet. There are several companies which will rent you your dream car for the day. When in Dubai, do as the locals do and drive a superfast car. Because you can. The Jumeirah Zabeel Saray hotel was inspired by Ottoman palaces. Their 86,000 square foot Talise Ottoman Spa is equally opulent and palatial with an indoor thalassotherapy pool, jacuzzi, snow room, saunas and steam rooms, and a Turkish hammam where you can lie back on a heated marble slab and get slathered, scrubbed and rubbed by your attendant. Book a scrub, have lunch, enjoy the thalassotherapy pool, and leave relaxed and refreshed and ready to conquer the day. There’s no shortage of places to eat in Dubai. 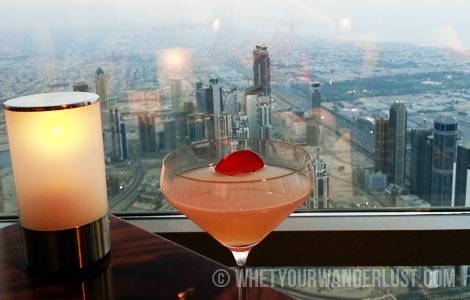 But for the ultimate in haute dining, skip the viewing platform of the Burj Khalifa and book at table at At.mosphere, the restaurant and lounge on the 122nd floor of the tallest building in the world. Book a table for dinner and drinks before dusk so you can enjoy the view before the sun goes down and enjoy watching the world go by at 1,400 feet. Everyone will agree that Dubai is a unique city in its own right, but there is perhaps no other city which is so unusual seen from the sky. If the view from the Burj Khalifa wasn’t enough for you, take a helicopter tour to get a bird’s eye view of Dubai’s modern wonders such as the Palm Jumeirah and the World Islands. This list is just to get you started. There are plenty of other splurgeworthy activities in this city (high-end shopping anyone?). What are your favourite things to splurge on in Dubai? Dubai is awesome indeed. Visited so many places, and food hubs last time. My favourite is Wagamama at Palm for their lovely health drinks. Great blog.